As the focus on concussion in the athletic and scholastic community is growing significantly, a need is present in the community served by the Bon Secours Charity Health System for appropriate concussion education, prevention, diagnosis and management. This need is recognized by both state and federal lawmakers who have made significant strides towards a more expertly derived and systematically implemented set of guidelines to address this problem. Chief among state and federal guidelines is the need for educational updates on concussion for coaches, athletes and parents, timely identification of possible concussion by event officials and athletic trainers, appropriate diagnosis by a physician specifically trained in concussion as well as implementation and coordination of management by those same physicians. These guidelines also call for the availability of computerized neurocognitive testing to aid in the diagnosis and management of concussion. The Bon Secours Concussion Management and Rehabilitation Program was created by Dr. Nicholas Belasco in response to this need. Using the most up-to-date technology, like ImPACT and the Sway Balance system, it provides an all-inclusive service to school systems, as well as club teams and other local sports organizations, who would like to make sure they comply with the rapidly developing federal guidelines on concussion as well as provide the best possible care to their athletes who suffer from concussion. There are many different facets to concussion evaluation and management, including cognitive function, orientation, postural balance, memory, exertion, and neurological symptoms. The Sway System provides rapidly obtained objective measurements to a wide array of medical conditions, providing an objective measurement of balance, motion reaction time and symptom scoring. This quantitative analysis supports acute or long term medical decision making and provides the ability to track outcomes and recovery scenarios. Sway is an FDA and Health Canada cleared medical device that is accessible via a computer or mobile device, which syncs with a HIPAA compliant, cloud based server for immediate access to patient information. Dr. Belasco is the only concussion specialist in the region who is a credentialed ImPACT consultant. Using tools such as the ImPACT Concussion Management Model, ImPACT addresses the need for an accurate, medically accepted assessment system that is used as a part of an overall concussion management protocol. This Model builds partnerships with healthcare professionals and athletic trainers to offer training and resources for affordable concussion management. ImPACT benefits athletes at all levels of play, from professional sports teams to students and their parents. Developed by clinical experts who pioneered the field, ImPACT (Immediate Post-Concussion Assessment and Cognitive Testing) is the most widely used and most scientifically validated computerized concussion evaluation system. ImPACT is an FDA cleared screening tool that provides trained clinicians with neurocognitive assessment tools and services that have been medically accepted as state-of-the-art best practices as part of determining safe return to play decisions. Additionally, Diffusion Tensor Imaging (DTI) is now available and has the potential to help physicians understand concussions by providing quantitative measurements of the subtle changes within the white matter tissue in the brain following a concussion. DTI is performed by using an MRI machine that is equipped with specialized software that measures the movement of water in nerve fibers in the brain. Mild concussion is difficult to diagnose because often the brain appears quite normal on conventional MRI so the solution is to use neuroimaging tools such as DTI to detect brain injuries in mild traumatic brain injury. Thanks to the Bon Secours Concussion Management and Rehabilitation Program, every school system, no matter how small, has the opportunity to provide the kind of concussion education and care previously only manageable by the largest and best supported colleges and universities. It also allows schools that have already started implementing concussion services to bring their programs to the next level of excellence. Sidelined by a head injury, a student athlete reshaped her life – and the way people think about concussions. That’s what Britta Beck recalls being told after another player’s knee slammed into her temple during a volleyball game. The Delaware Valley, PA, athlete was discharged from a local hospital and advised to just rest. Beck returned home and read a book to prepare for a test. The next day, pen in hand, she racked her brain for answers — but she could not recall a single word she’d read the day before. “That’s when I realized this was far more than ‘just’ a concussion,” says Beck. Beck and her family turned to Nicholas Belasco, DO, CIC, a sports-medicine physician and the Medical Director of the Bon Secours Concussion Management and Rehabilitation Program, a member of the Westchester Medical Center Health Network (WMCHealth). 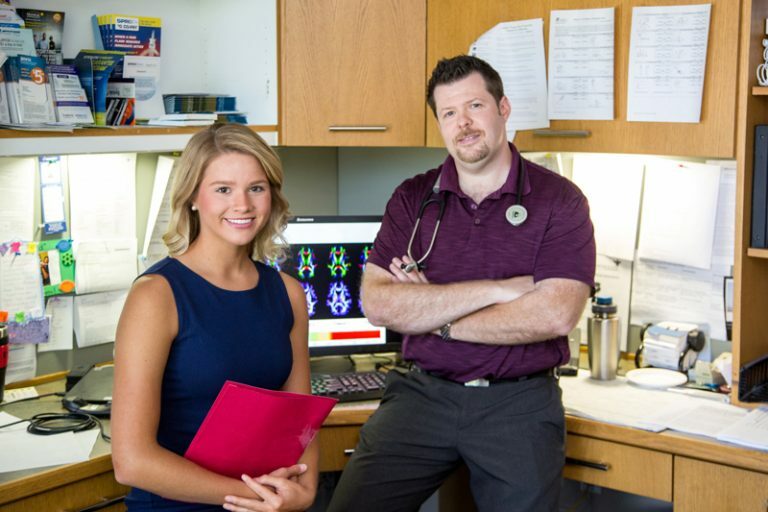 As a regional expert on concussions, Dr. Belasco began a thorough evaluation of his young patient, coordinating a program of therapies that recruited various specialists to address Beck’s cognitive and balance issues. “When it comes to concussions, there is a remarkable amount of misunderstanding and misinformation,” says Dr. Belasco, whose WMCHealth concussion-and-rehab center treats between 1,500 and 2,000 head injuries a year and recently entered into a partnership with the CDC. Yet, Beck stayed the course to graduate on time, sticking to her doctor’s prescribed restrictions on visual stimulation and daily distractions, such as cell phones and computers. “Being a teenager, that’s very hard, but I trusted Dr. Belasco, and that’s how I got better,” she says. Today, Beck pursues a blended major of neuroscience and neuropsychology at Endicott College in Massachusetts. She has resumed her athletics, swimming regularly and is even training for triathlons. She continues to struggle with headaches and fatigue, but it doesn’t hold her back. “In college,” she jokes, “everybody naps.” Last summer, she completed an internship at Dr. Belasco’s office, researching how mouthguards with sensor technology might help shield football players from head injuries.